The full motion mount fits 37" to 70" flat panel TVs with VESA mounting hole patterns within 200-600mm wide and 100-400mm high. This TV mount is constructed with heavy duty solid steel with powder-coated black finish providing security and stability. Articulating arm design allows display to be folded parallel to wall to save space. First, please check your wall for wood studs, it can’t be used on concrete wall or drywall alone. Anchor needed is for concrete wall installation. Next, the weight of your TV should be less than 132lbs (60kg). Then, mounting holes distance on the back of TV must be less than 24" (600mm) horizontally and 16" (400mm) vertically. Your TV should be at least 37 inch. Otherwise, you will see the bracket. Finally, please check possible blocked cable/input. Wall mounting studs distance up to 16"
SAVES YOU SPACE: When you hang your flat screen TV on our TV wall mount you will save you a lot of space around your living room. Our articulating TV wall mount retracts 2.8" from the wall and extends up to 16" giving you more space to host your friends and family. HOLDS TVs UP TO 132lbs: Tested to hold 4 times the weight of TV based on the UL standard. 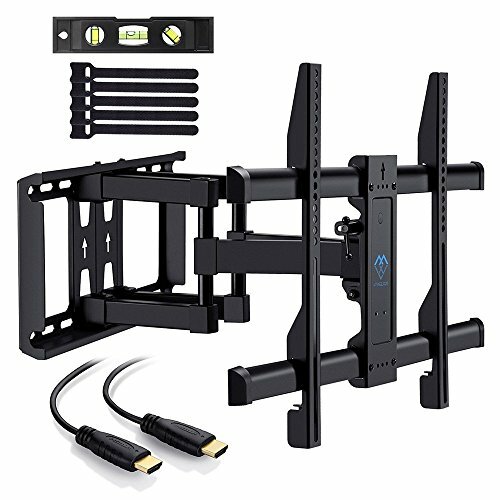 This TV mount for flat screens is guaranteed to hold your television mount in place without fear of it falling off. Our heavy-duty wall mount TV bracket is made with high grade steel that ensures reliable weight loading and makes the unit sturdy and safe. WATCH TV FROM ANYWHERE: Our television wall mount comes with +5°/-15° Tilt, +/-90°Swivel and +/-3°rotation for maximum viewing flexibility. It comes with a tilt and swivel TV mount feature for maximum flexibility that helps you to choose the perfect angle to view your screen from anywhere in the room and enhance your viewing experience. FITS TVs 37-70 INCHES: A flat screen TV wall mount that is suitable for most 37 inch TV's all the way up to 70 inches. Compatible with VESA mount mounting hole patterns ranging from 200x100mm to 600x400mm. Built with a low profile TV mount appearance so you can mount it close to the wall to avoid accidents occurring. PACKED FULL OF GOODIES: Your TV mount comes with a 6-outlet surge protector which will help you to plug in multiple devices. 2 x 6 feet HDMI cables to connect your gaming console or computer to the TV. 5 x Velcro cable ties to keep your cables from tangling. 1 x 60ml anti-static screen cleaning solution to keep your screen sparkling new and a 3-Axis magnetic bubble level so you can level your TV perfectly. View More In TV Ceiling & Wall Mounts. If you have any questions about this product by PERLESMITH, contact us by completing and submitting the form below. If you are looking for a specif part number, please include it with your message.